July 23-27, 2018 at The San Francisco School America’s only course combining the dynamic repertoire of jazz with the dynamic pedagogy of Orff Schulwerk, this remains a tried-and-true way to make teachers and their students confident that they, too, can play, understand and appreciate this great American art form. This course works best for jazz players new to Orff and Orff teachers new to jazz, but all those eager to learn are welcome. Those have taken the course previously are welcome to return and enjoy the new material. PLEASE NOTE that though this course runs concurrent with the SF Orff Course Intro the registration process is separate. 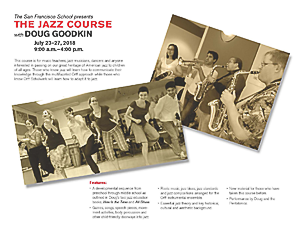 Download the brochure below and send in registration with a check to Doug Goodkin – no Paypal payments or online registration available for this course.